We would like to recognize our Neurologist, Dr. Shawn Hussain. We first met Dr. Hussain back in 2010 when our then 5-year-old daughter, Natalie was first diagnosed with epilepsy. Dr. Hussain was one of the main Neurologists working to find the right medications to bring Natalie’s seizures under control. Natalie has been hospitalized several times since then and most recently, was admitted for a lengthy stay in the PICU at UCLA for 5 months with refractory seizures. Natalie was put into an induced coma, given trial drugs and a few other treatments. All through this trying ordeal, Dr. Hussain was there for our family and Natalie. Guiding her treatment, remaining a steadfast source of calm and comfort for us all. Dr. Hussain worked tirelessly to find a medication to stop Natalie’s seizures. He never gave up. He spent hours researching and filling out the necessary paperwork needed to get an experimental new drug for Natalie to try. This new drug is the reason Natalie was able to go home and become seizure free. We owe so much to Dr. Hussain. He went above and beyond his duties to help Natalie. 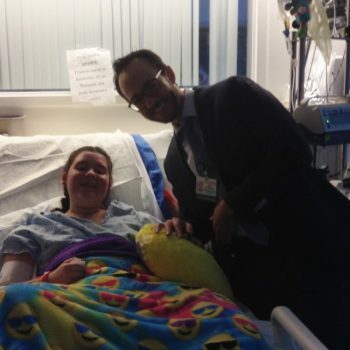 After we got home we found out that Dr. Hussain had taken the time to send a letter of thanks to the pop singer Shawn Mendes, of whose music our daughter loves and listened to constantly in her hospital room to lift her spirits. Dr. Hussain sent a letter to Mendes thanking him for the video message Mendes had sent to Natalie while she was in the hospital. Dr. Hussain has many patients and a family of his own but that didn’t stop him from taking the time to send this letter which was later read on the air on KIIS FM radio. We can’t say enough about the excellent medical care we received from Dr. Hussain. We will be forever grateful that he came into our lives and are so thankful that our daughter has a wonderful doctor to turn to when she needs medical care.